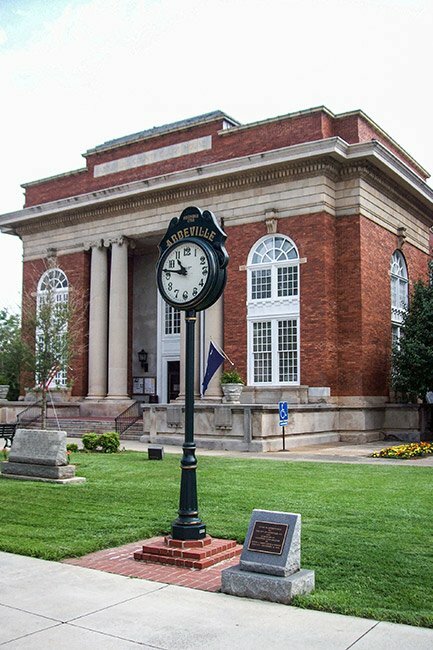 Located next to the historic Abbeville Opera House on the town’s picturesque Court Square, this courthouse (shown below at left) has served the residents of Abbeville County for over 100 years. 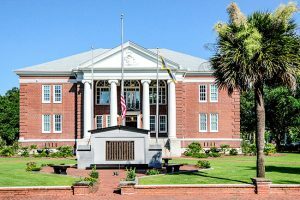 The Abbeville County Courthouse was designed by Darlington native William Augustus Edwards of the Atlanta architectural firm Edwards, Walter, and Parnham. 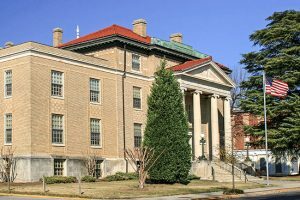 Edwards is responsible for the design of many South Carolina buildings, including the Sumter County Courthouse, First Baptist Church of Darlington, and Japonica Hall. 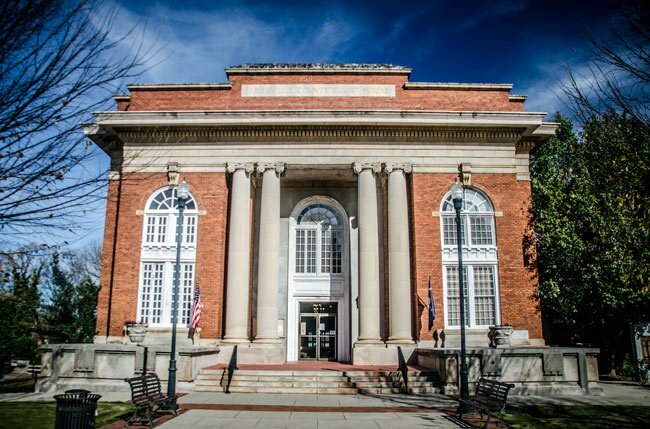 The courthouse was completed in 1908 by Abbeville contractor Frederic Minshall and has continuously served as the center of government in Abbeville County. Each Election Day, men and women gather here to renew old friendships and to discuss election results and current events. Edwards also designed the adjacent opera house, also built in 1908, using many of the same elements he did for the courthouse. Offices comprise most of the ground floor, while the courtroom primarily occupies the second floor. A tabernacle frame behind the judge’s seat boasts three stained glass windows. 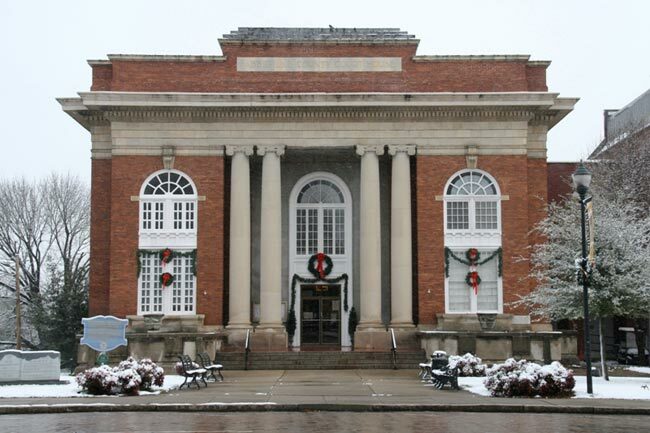 The courthouse was renovated in 1964 by the Columbia firm of Lyles, Bissett, Carlisle, and Wolff. 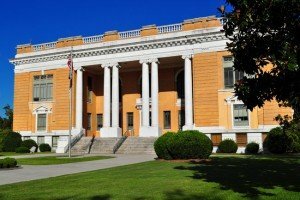 Constructed in 1908 to replace an earlier courthouse destroyed by fire, the Abbeville County Courthouse is one of six existing courthouses in South Carolina designed by Darlington native William Augustus Edwards of the Atlanta firm of Edwards and Walter. Frederic Minshall of Abbeville was the contractor. 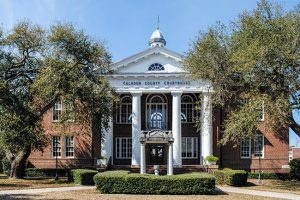 As with Edwards’ other county courthouses, Abbeville’s incorporates heraldic devices and symbols of justice to emphasize the symbolic role of county government. 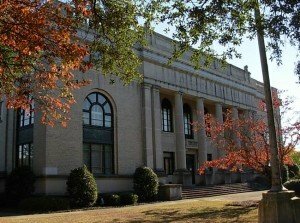 Edwards used colossal orders, formal symmetry, fasces, escutcheons, lions’ heads, swords, tomes and other explicit or implied symbols of law, reason, truth and power in his courthouses, and many of these features are evident in the Abbeville County Courthouse. 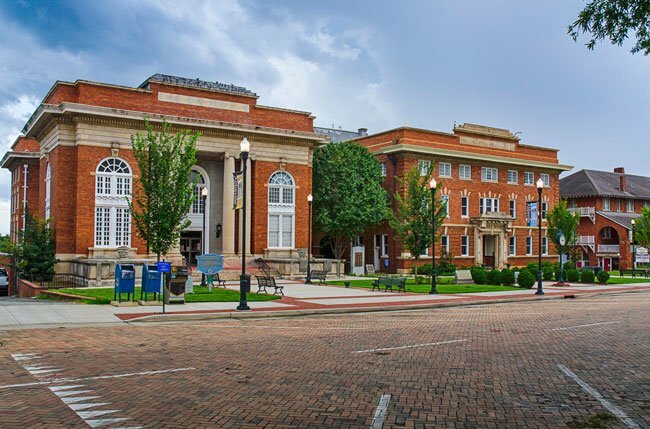 The courthouse is a monumental two-story brick building located on Abbeville’s public square, and is connected with a brick arcade to the adjacent Opera House and Municipal Office Building. 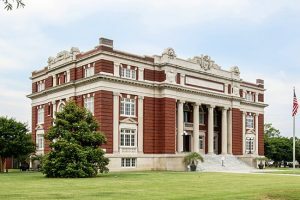 It was built in the Beaux-Arts classical style. A projecting entrance pavilion characterizes the façade with a colossal Ionic portico in antis of stone construction. The portico has two pair of unfluted stone columns, with Scamozzi capitals, which support a full entablature. 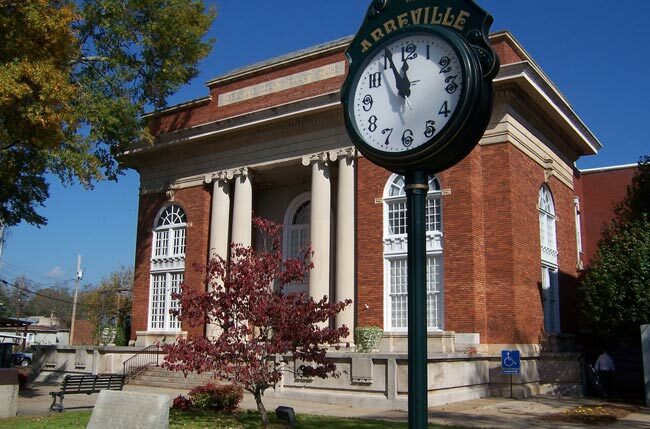 A broad brick attic story rises above the entablature, and this story bears a stone course inscribed ‘ABBEVILLE COUNTY COURT HOUSE.’ The courthouse underwent restoration in 1964 by Lyles, Bissett, Carlisle, and Wolff of Columbia and falls within the Abbeville Historic District. Hi, Leu. If you go to the link to the courthouse above the map, hopefully you will find someone to help you with your inquiry. Best of luck! I am looking for a copy of a will of James Norrell. An abstract from the library said it was dated August 12, 1779 and was in Box 70, Pack 1709 in your courthouse. If you have it there, please inform me how to receive a copy. Thank you.